Oden State Fish Hatchery was built in 1921 and from the beginning was a popular stop for people traveling US-31 to view trout in the raceways and pools. 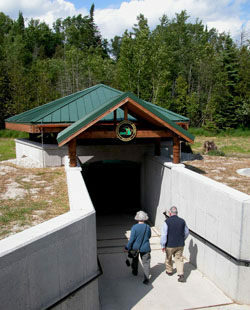 In 2002 the state built a new hatchery a half mile to the north and then spent $2 million to turn the original site into the Michigan Fisheries Visitor Center with trails, displays and a viewing chamber that puts visitors eye-to-eye with a trout. The original hatchery building is now a visitors center with an information area on fishing in Michigan along with a video of hatchery operations and a collection of mounted fish including the state record brown trout, a 34-pound, six-ounce monster. The most interesting exhibits are in an adjacent railroad car that has been renovated to resemble the Wolverine, Michigan's last "fish car." From 1888 to 1931, fish cars were used to transport millions of trout across the state from the hatcheries to the streams and lakes being stocked. Inside the Wolverine are rolls of milk cans that were packed in ice and used to carry the hatchery fish. They were painted in bright colors as not be confused with milk cans that actually held milk. The car also contains the living quarters for "fish mechanics," young hatchery workers who lived and traveled on the train. Their main task was to aerate the water to keep the fish alive. From the rail car Hatchery Loop winds 1.25 miles across the 130-acre site to the raceways at the Oden Fish Hatchery as a mix of two-tracks and paved paths. The Nature Trail, a paved handicapped-accessible path, is a loop of only 0.8 miles that includes the Stream Viewing Chamber and Big Fish Pond. Both routes wind through upland hardwoods, skirt Oden Creek and include interpretive exhibits. The visitor’s center and a hike to the thousands of trout swimming in the raceways makes for an ideal adventure for families with young children, an outing where they are guaranteed to see fish. The Hatchery Loop and the Nature Trail follow the same paved path and are posted near the Wolverine Rail Car. You begin by skirting the rehabilitated Oden Creek and at Mile 0.2 arrive at the impressive Stream Viewing Chamber. The submerged chamber enables visitors to glimpse trout and aquatic life in their natural habitat. It’s possible at times On to see brook, brown and rainbow trout swimming by or even rising to the surface to feed. Another 100 yards beyond the chamber is Big Fish Pond. From an observation area on the edge of this small pond you can look down and see huge trout slowly swimming past you. Most of them are brown trout six to 10 pounds in size but a few probably exceed 15 pounds. At Big Fish Pond, the Nature Trail swings east and Hatchery Loop continues north into the hardwood forest. You skirt Spring Pond and then at Mile 0.7 arrive at Oden Fish Hatchery. An Information Kiosk in the large parking area has more displays and information about tours while to the east are the raceways. You stroll past three buildings with each containing four raceways. The raceways are 2.5-feet deep, contain 19,000 gallons of water and, depending on the species being raised, could be holding 60,000 to 75,000 fish at a time. Oden State Fish Hatchery raises up to a million brown and rainbow every year, releasing them as six to eight-inch fish throughout the northern half of the Lower Peninsula and in the eastern third of the Upper Peninsula. Just beyond the third raceway building a paved path heads south past the Settling Pond and then becomes a foot path. Eventually the trail crosses Oden Creek via a bridge and merges into the paved trail. Head left to return to the rail car and visitors center at Mile 1.25. The old hatchery is now the Michigan Fisheries Visitor Center designed as an interpretation area for the Great Lakes watershed. 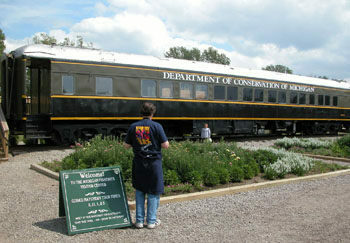 Adjacent to the visitor center is the re-created 1914-1935 Wolverine train car with historic exhibits that depict how employees of the old Michigan Department of Conservation lived on the train while transporting and stocking fish across the state. Also at the center are restrooms, picnic tables and drinking water. The visitor center is open daily from 10 a.m. to 6 p.m., from Memorial Day through Labor Day. Fall hours (Labor Day to Nov. 1) are 10 a.m. to 5 p.m., Tuesday to Saturday, and noon to 5 p.m. on Sunday. Oden State Fish Hatchery is open to the public only through a scheduled guided tour. The one-hour tours are conducted each day, seven days a week, from Memorial Day to the end of August and begin at the new hatchery on South Ayr Road. Visitors interested in a tour should call ahead for times. 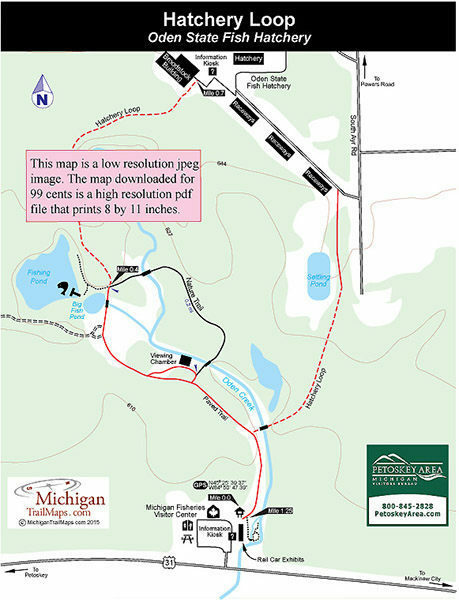 The Michigan Fisheries Visitor Center is located on US-31 a half mile west of Oden and 6 miles east of Petoskey. To reach the new hatchery from US-31, head north on Conway Road for a mile and then west on Powers Road for another mile. Turn south on South Ayr Road and the hatchery is a half mile on the right-hand side. Contact the Michigan Fisheries Visitor Center (231-348-0998) or the Petoskey Area Visitors Bureau (231-348-2755, 800-845-2828; www.petoskeyarea.com).